One feature team (for a significant new product) was set up on their own so they wouldn't get slowed down by everyone else. They were successful in creating a new product offering in a short period of time, but now it was difficult to integrate their changes back in to the common infrastructure. Also, because this team had been accustomed to working on their own, they were resistant to "coming back under the umbrella" now that their efforts had been successful. 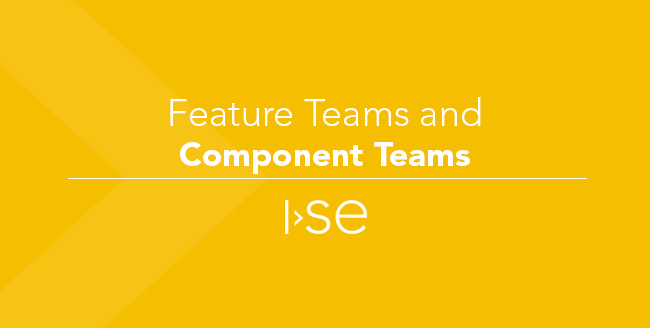 Feature teams affected shared infrastructure by creating competing and, in some cases, incompatible solutions to the same problems. 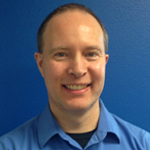 In some instances, the feature teams did not have the depth of experience or expertise necessary to create appropriate changes to the infrastructure - while their solutions worked, they did not have all the adaptations necessary to support the full scalability, performance, availability (etc.) needed for the entire product suite. 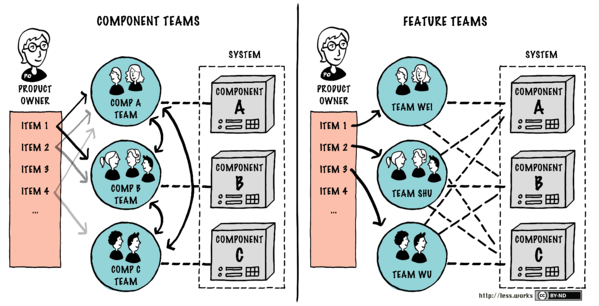 The dilemma of feature teams and component teams arises as part of the scaling problem: how do we divide up the people and the work when we have to have more than one team to accomplish our goals, and the work is not completely independent? Agile frameworks do have a definite bias towards feature teams - and for good reason: feature teams speed the delivery of value by reducing cross-team dependencies. The dilemma of feature teams vs. component teams comes in when we consider shared infrastructure (shared code) and specialization of skill or knowledge. How to handle components and moving from silos to shared? Create technical stories and assign them to a feature team. Preference: mostly feature teams, use component teams where either the reuse ROI is high, and/or the depth of skill/expertise (specialization required) is very high. In my own organization, I also see experimentation with cross-team technical expertise (in some ways, a form of architecture governance): members across teams frequently meet to discuss and resolve technical considerations so that the amount of cross-team incoherence is minimized. This seems to me to be another feedback loop to help feature teams be successful in addressing underlying infrastructure challenges. My colleague's discussion and frustration was a great learning opportunity for me. After exploring his frustrations and what others have written about feature teams vs. component teams, I can sympathize with his frustration, and I can see why the agile bias towards feature teams exists. However at the end of the day, adherence to a particular model or framework is less important than the agile inspect and adapt loops: what results are our systems creating, and what might we do differently to improve those results? Do you encounter some of these same frustrations? How does your team handle these challenges? Comment below to join the conversation and check out our other insightful blog posts on Agile for more tips!